RMS Mauretania (also known as "Maury"), sister ship of the Lusitania, was a Lusitania-class ocean liner built by Swan, Hunter & Wigham Richardson at Wallsend, Tyne and Wear for the British Cunard Line, and launched on 20 September 1906. At the time, she was the largest and fastest ship in the world. Particularly notable was her steam turbine propulsion, which was a revolutionary development in ocean liner design. 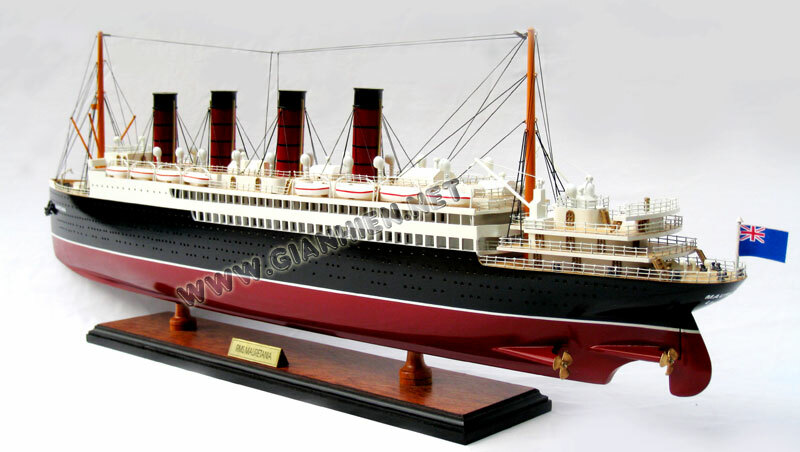 Mauretania became a favourite among the passengers, attributable to her luxury, speed, and safety. After capturing the Blue Riband for fastest transatlantic crossing during her 1907 inaugural season, Mauretania held the speed record for twenty-two years. The ship's name was taken from Mauretania, a ancient Roman province on the northwest African coast, not related to the modern Mauritania. Similar nomenclature was also employed by Mauretania's sister ship, the Lusitania, which was named after the Roman province directly north of Mauretania, across the Strait of Gibraltar. In 1897 the German liner SS Kaiser Wilhelm der Grosse became the largest and fastest ship in the world. With a speed of 22 knots (41 km/h), it snatched the Blue Riband from Cunard Line's Campania and Lucania. At around the same time American financier J. P. Morgan’s International Mercantile Marine Co. was attempting to monopolize the shipping trade, and had already acquired Britain's other major transatlantic line White Star. In the face of these threats the Cunard Line was determined to regain the prestige of ocean travel back not only to the company, but also to Great Britain. 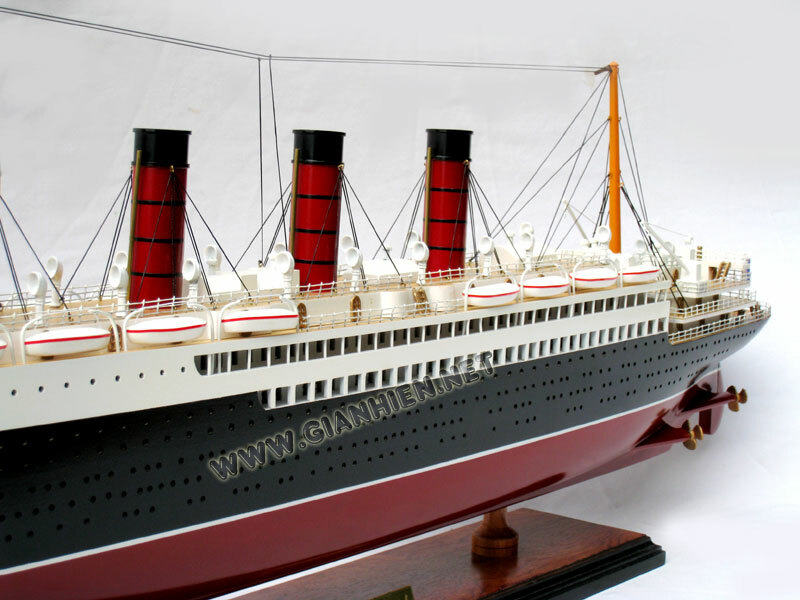 In 1903, Cunard Line and the British government reached an agreement to build two superliners, the Lusitania and Mauretania, with a guaranteed service speed of no less than 24 knots, the British government were to loan £2,600,000 for the construction of Mauretania and Lusitania at an interest rate of 2.75% to be paid back over twenty years with a stipulation that the ships could be converted to Armed Merchant Cruisers if needed, also to fund these ships further the admiralty arranged for Cunard to be paid £150,000 per year increase to their mail subsidy. The Mauretania was designed by Cunard naval architect Leon Peskett with Swann Hunter working from the plans struck for Lusitania which was the premier ship of the class. Peskett's original configuration for the ships in 1903 was a three-funnel design when reciprocating engines were destined to be the powerplant. A giant model of the ships in this configuration appeared in Shipbuilder's magazine. Cunard in 1904 decided to change powerplants to Parson's new turbine technology and Peskett then implemented a fourth funnel to the ships in order to vent all of the turbines' powerful exhaust. Peskett, at Cunard's behest, also designed the ships with a narrower beam than normal for ships this size. This to streamline the hulls for more speed through the waves, at the sacrifice of stability, and both Lusitania & Mauretania developed reputations for being rollers in rough seas. Mauretania during a speed trial off St AbbsIn 1906, Mauretania was launched by the Duchess of Roxburghe. At the time of her launch, she was the largest moving structure yet built, and slightly larger in gross tonnage than her sister Lusitania. 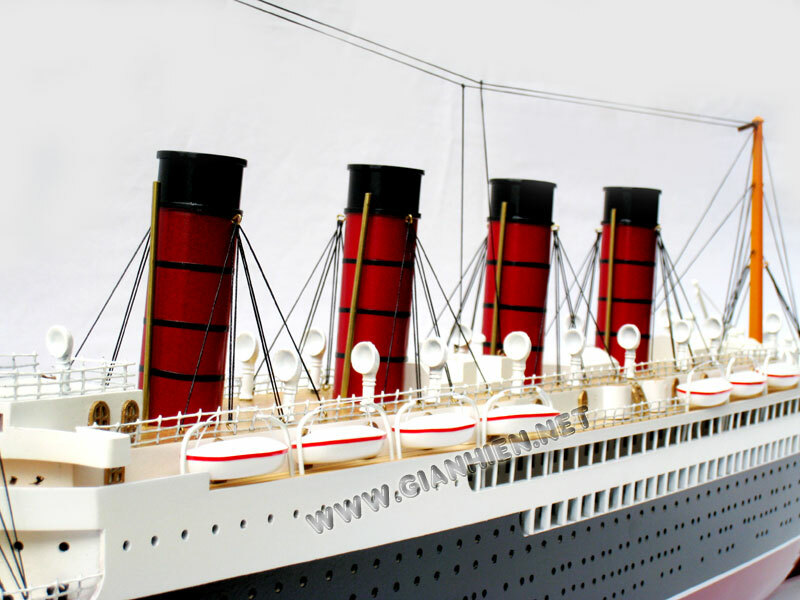 The main visual differences between Mauretania and Lusitania was that Mauretania was five feet longer and had different vents (Mauretania had cowl vents and the Lusitania had oil drum-shaped vents). Mauretania also had two extra stages of turbine blades in her forward turbines making her slightly faster than the Lusitania. The Mauretania and Lusitania were the only ships with direct-drive steam turbines to hold the Blue Riband; in later ships, reduction-geared turbines were mainly used. Mauretania's usage of the steam turbine was the largest yet application of the then-new technology, developed by Charles Algernon Parsons. During speed trials, these engines caused significant vibration at high speeds; in response, Mauretania received strengthening members and redesigned propellers before entering service, which reduced vibration. 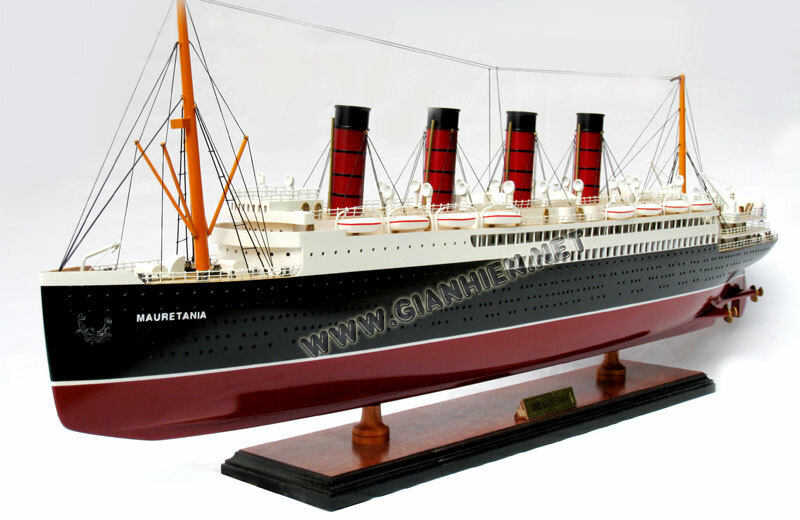 Mauretania was designed to suit Edwardian tastes, with twenty-eight different types of wood used in her public rooms, along with marble, tapestries, and other furnishings. Wood paneling for her first class public rooms was meticulously carved by three hundred craftsmen from Palestine. The multi-level first class dining saloon was decorated in François I style and topped by a large dome skylight. A series of elevators, then a rare new feature for liners, were installed next to Mauretania's grand staircase. A new feature was the Verandah Café on the boat deck, where passengers were served beverages in a weather-protected environment. Mauretania left Liverpool on her maiden voyage on 16 November 1907 under the command of her first captain, John Pritchard and later that month captured the record for the fastest eastbound crossing of the Atlantic with an average speed of 23.69 knots (43.87 km/h). In September 1909, the Mauretania captured the Blue Riband for the fastest westbound crossing—a record that was to stand for more than two decades. In December 1910 Mauretania broke loose from her moorings while in the River Mersey and attained damage that caused the cancellation of her special speedy Christmas voyage to New York. In a quick change of events Cunard rescheduled Mauretania's voyage for Lusitania under the command of James Charles (who was future commodore of the line) which had just returned from New York. Lusitania herself completed Christmas crossings for her sister, carrying revellers back to New York. In 1912 both King George and Queen Mary were given a special tour of, Mauretania, then Britain's fastest merchant vessel. This further added distinction to the ship's reputation. On 26 January 1914, while Mauretania was in the middle of annual refit in Liverpool, four men were killed and six were injured when a gas cylinder exploded while they were working on one of her steam turbines. The damage was minimal and she returned to service two months later. Shortly after Great Britain declared war on Germany on 4 August 1914, Mauretania and Aquitania were requested by the British government to become an armed merchant cruiser, but their huge size and massive fuel consumption made them unsuitable for the duty; leading to them resuming their civilian service on 11 August. 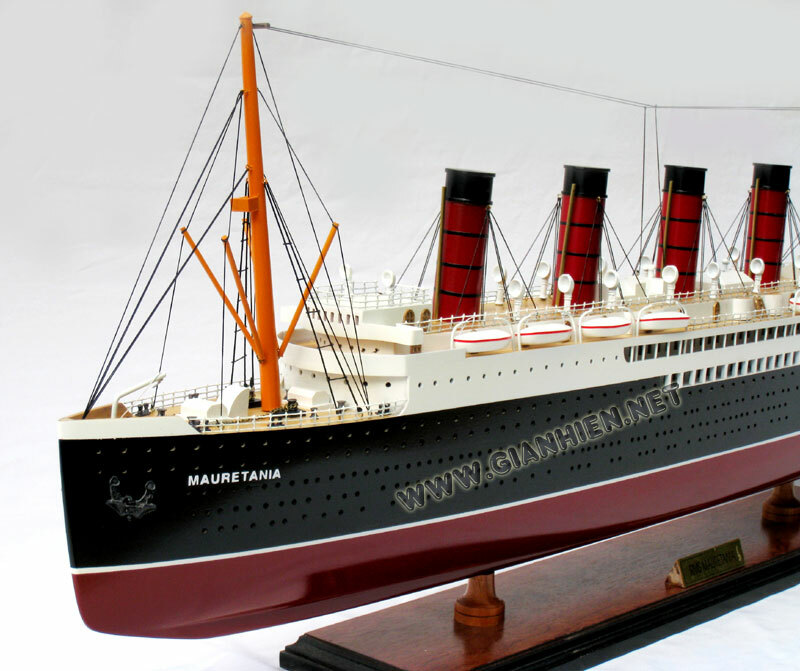 Later, due to lack of passengers crossing the Atlantic, Mauretania was laid up in Liverpool until May 1915, when her sister ship Lusitania was sunk by a German U-boat. Mauretania was about to fill the void left by Lusitania, but she was ordered by the British government to serve as a troopship to carry British troops during the Gallipoli campaign. She avoided becoming prey for German U-boats because of her high speed and the seamanship of her crew. HMHS MauretaniaWhen combined forces from the British empire and France began to suffer heavy casualties, Mauretania was ordered to serve as a hospital ship, along with her fellow Cunarder Aquitania and White Star's Britannic, in order to treat the wounded until 25 January 1916. Seven months later, Mauretania once again became a troop ship when requisitioned by the Canadian government to carry Canadian troops from Halifax to Liverpool. Her war duty was not yet over when the United States declared war on Germany in 1917, and she carried thousands of American troops until the end of the war. As a troopship, Mauretania received dazzle camouflage, a form of abstract color scheming, in an effort to confuse enemy ships. The dazzle painting was not used when Mauretania served as a hospital ship. In medical service the vessel was painted white with large medical cross emblems surrounding the vessel. Mauretania returned to civilian service on 21 September 1919. Her busy sailing schedule prevented her from having an extensive overhaul scheduled in 1920. However, in 1921 Cunard Line removed her from service when fire broke out on E-deck and decided to give her a much-needed overhaul. She returned to the Tyne shipyard of her birth, where her boilers were converted to oil-firing, and returned to service in March 1922; however, it was also noticed by Cunard that Mauretania was still struggling to maintain her service speeds and it was apparent that her once-revolutionary turbines were in desperate need of overhaul. In 1923, a major overhaul was begun in Southampton, involving the dismantling of Mauretania's turbines. Halfway through the overhaul, the shipyard workers went on strike and the work was halted, so Cunard had the ship towed to Cherbourg, where the work was completed at another shipyard. In May 1924, the ship returned to Atlantic service. The Mauretania's Second Class Smoking Room.In 1928 Mauretania was modernised with new interior design and in the next year her speed record was broken by a German liner, the Bremen, with a speed of 28 knots (52 km/h). On 27 August, Cunard permitted the former ocean greyhound to have one final attempt to recapture the record from the newer German liner. She was taken out of service and her engines were modified to produce more power to give a higher service speed; however, this was still not enough. The Bremen simply represented a new generation of ocean liners that were far more powerful and technologically advanced than the aging Cunarder. Even though Mauretania could not outrace her German rival, the ship did beat her own speed records both eastbound and westbound. In 1929 Mauretania collided with a train ferry near Robbins Reef Light; fortunately, no one was killed or injured and her damage was quickly repaired. In 1930, with a combination of the Great Depression and newer competitors on the Atlantic run, Mauretania became a dedicated cruise ship. When Cunard Line merged with White Star Line in 1934, Mauretania, along with Olympic, Majestic and other aging ocean liners, were deemed surplus to requirements and withdrawn from service. Cunard withdrew Mauretania from service following a final eastward crossing from New York to Southampton in September 1934. 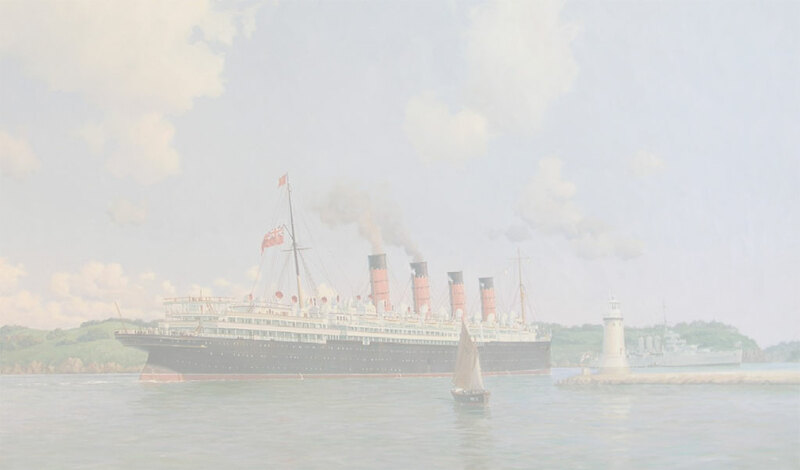 The final crossing was made at an average speed of 24 knots (her original contractual speed stipulation for her mail subsidy), and Mauretania was then laid up at Southampton awaiting her fate next to the former one time White Star Line flagship Olympic. Thus marked the end of twenty-eight years of service with Cunard. In May 1935 her furnishings and fittings were put up for auction and of the 1st of July that year she departed Southampton for the last time to T.W Wards shipbreakers at Rosyth. One of her former captains, the now retired commodore Sir Arthur Rostron (captain of the RMS Carpathia during the Titanic rescue), came to see her on her final departure from Southampton. Rostron refused to go aboard Mauretania before her final journey, stating that he preferred to remember the ship as when he commanded her. En route to the breakers, Mauretania stopped at her birthplace the Tyne for half an hour, where she drew crowds of sightseers and was boarded by the Lord Mayor of Newcastle. The mayor bid her farewell from the people of Newcastle, and her last captain, A.T. Brown, then resumed his course for Rosyth. The ship passed under the Forth Bridge (for which her masts had to be cut down), and was delivered to the shipbreakers. The demise of the beloved Mauretania was protested by many of her fans, including President Franklin D. Roosevelt who wrote a private letter arguing against the scrapping. Some of the furnishings from the Mauretania were installed in a bar/restaurant complex in Bristol called the Mauretania Bar (now Java Bristol), situated at the bottom of Park Street (the hill leading to the Wills Memorial Building of Bristol University) behind the Council House on College Green. The lounge bar was paneled with mahogany, which came from her first class library. The neon sign on the south wall still advertises the "Mauretania," and her bow lettering was used above the entrance. Additionally, the first class reading-writing room has become the board room at Pinewood Studios, west of London. The Mauretania is remembered in a song "Firing the Mauretania", with versions collected separately by Redd Sullivan and Hughie Jones. They both start "In 19 hundred and 24, I… got a job on the Mauretania"; but then go on to say "shovelling coal from morn till night" (not possible in 1924 as she was oil-fired by then); the number of "fires" is said to be either 64 or 34; but perversely the last verse on Hughie's version says "trimmers" not "stokers", so perhaps this is a reference to oil.